Last month, I was fortunate to spend eight days and eight nights in one of my favorite cities, Seattle. I was there for many reasons, namely to attend my best friend John’s wedding, watch the Longhorns play in the NCAA Volleyball Final Four and spend Christmas with Oregon Jenn and her family (you’ll remember her as the beautiful bride.) Wrapping up things before leaving town for more than a week meant that I didn’t have time to give myself a manicure. Chipped nail polish is a HUGE pet peeve of mine. The morning following my arrival in the Emerald City, getting a manicure was high on the priority list. I tasked John with finding a nail salon for us to get manis. I trusted him to find the perfect place, and he nailed it. (HA! Pun intended!) We ended up at Julep Nail Parlor. I was excited. 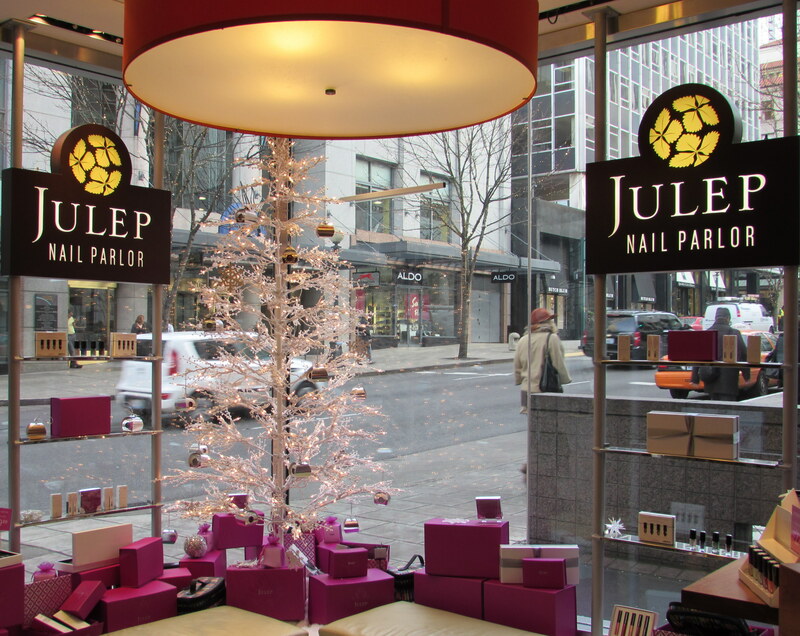 I had heard of Julep nail color, but I had no idea that it was borne out of Seattle and these chic nail salons. Per the Julep website, “We believe beauty is about connection, not competition.” Those words could have come straight out of my mouth! Consequently, all of their nail colors are named after women, for whom this business serves. Upon entering the Julep Nail Parlor, I noticed right away that it didn’t smell like a nail salon. That’s due in part to their “4-free” formula; Julep nail colors do not contain formaldehyde, formaldehyde resin, toluene, or DBP. For $48, it sounded like a wonderful salon experience for a fair price. As you can see from the photo, we were seated next to each other, appropriately dressed for the UT volleyball match later that evening. Everything about the service was fantastic. I’m typically a DIY girl when it comes to my nails, but I do enjoy rxprednisone spoiling myself every now and again with a spa nail treatment. On these rare occasions, my most dreaded moment is having to choose a nail color. Julep exacerbated this issue with so many amazing colors from which to choose! I opted for Evelyn, a creme fuchsia shade that was perfect for the holidays, from the December 2013 Maven collection. Each month, Julep releases a selection of new colors, and as a member of their Maven program ($19.99 monthly fee), you’ll receive 2-3 nail colors each month based on your style profile. We’ll see how much longer I can resist from signing up. I own an embarrassing number of nail polish colors, but I’m pretty sure I need to be a Julep Maven. I left the Parlor with a fresh bottle of Evelyn and also Eden, a violet shade that John helped me choose and donated to me from his Julep Manicure. And a bottle of Celia, a glittery jade. And also Meryl, a creme gray. And a bottle of Olivia, a creme espresso, for Oregon Jenn. Don’t judge me! Everything was 50%, so how could I not? Plus I bought a bottle of Vanish Cuticle Softener & Remover. I’ve been using all of my new products, and they all have great wear and vibrant, true-to-the-bottle colors. It’s either unfortunate or fortunate for me that Julep Nail Parlors are only in the Seattle area. My manicure lasted for at least 4-5 days without chipping, which is definitely better than most in-salon manicures I’ve had. To save on a visit to the doctor buy generic Cialis online from trusted pharmacies represented here http://howmed.net/cialis-generic/. Not to mention being the perfect, pampering experience for your paws during winter. If you live in Seattle, I’d highly recommend you visit one of the four locations. And if you have access to the internet, I’d highly recommend that you purchase some nail color. I’m surely enjoying all my Julep goodies! This entry was posted in Vanity and tagged Julep, local love, manicure, nail color, nail salon, Seattle on January 10, 2014 by jenn. Hi, my names Heather; and I’ve recently been contemplating a path in beauty blogging. I currently work a 40 hr/wk job like most. But as my 22nd approaches this year in February, I began to feel more pressure about choosing a career path. It would be very helpful to get real insight about this field and your personal experience so far.